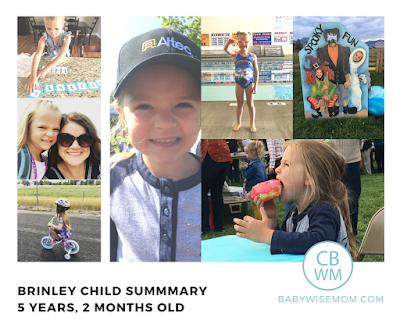 This is a summary for Brinley from 5 years 1 month to 5 years 2 months old. I commented last time about Brinley’s night with bad dreams. Brinley woke up with nightmares. She had a few in one night. Whenever my kids have bad dreams, I encourage them to talk about them. I read long, long ago that it is good for them to talk about the dream. So the next morning, she told me all about the bad dream. That night, she was afraid to go to sleep because she didn’t want to have the bad dream again. Thus far in her life, she has slept without most of the potential sleep crutches that can come along. She has never sucked on anything. She has a favorite blanket to sleep with, but she can sleep without it. She will even pack it the night before we leave and choose not to sleep with it so we don’t forget it the next day. She was swaddled as a baby, and she has always had a sound machine to help block out the noises of the household. But never a night light. That night, she was genuinely scared. A hard thing with dreams is I can’t promise she won’t have another scary dream. At all. I won’t promise that to her because odds are that she will have a bad dream again. She is pretty logical, and Brayden and I are both very logical. So we both chatted with her about her concerns that night. In the end, we plugged in a night light. Many years ago, we bought a bunch of these night lights (affiliate link). I like these because they aren’t too bright. I also like that they can be pointed in various directions, so I can make it so they don’t shine right at the child. I point them at the floor. These are also automatic, so they turn on when it is dark and off when it is light. I didn’t love using a night light when she has made it five years without one, but at the same time, she really was scared and this helped her feel more secure. So it is in her room now. We also set up her stuffed animals to watch over her. A big thing with bad dreams is to help the child feel more secure. Some people create a “bad dream spray” and spritz it around the room. Prayers are wonderful. You want to set the child up to feel secure and powerful over her sleep. These stuffed animals watching over her helped her feel more safe and secure. Eating is great! She is eating well and eating a nice variety of foods. Kindergarten is going very well so far. Despite my being confident she was ready for Kindergarten as a young child in the grade (see Why We Chose To Send Our Daughter to Kindergarten On Time), I couldn’t help but worry. All those posts on the Internet are all around talking about how you must keep your child back…it makes you second guess and question yourself, no matter how sure you felt. It makes you question if you really have your child’s best interest at heart, because what good parent wouldn’t give their child every advantage they could create? As I wrote in the post, I don’t feel that is the best way to parent at my core, however. I think there should be challenge in life. I think it makes us stronger as people. Real life is FULL of challenges. We seem to only get brief respite from difficulties in life, then we are thrown right back in. If I make life easy for my children, then how will they develop the skills to face adult life issues? She is doing so well in every way. She loves school. The week before school starts, they test every kindergartner to see where they are academically going into the year. Brinley tested as 92% against ALL of the kindergartners in the ENTIRE DISTRICT. That was just such a strong relief to me. It verified what I felt to be true–that even though she is young in the grade, she is ready to be there. She is not struggling at all with any of the learning at all. Despite being young, she is way above average for the average child in kindergarten. Keeping her back would not have been the best move for her. She is doing well socially, also. She has made a lot of friends. Her teacher tells me that she never sees Brinley without a large group of children around her and that she is a social butterfly. She is still thrilled every day to go to school. She is loving learning. She is doing very well at listening and following directions. She is able to sit still. It is all such a relief! We do have Kindertude. It doesn’t seem as strong to me as my other kids were, but that could be in large part because she is my fourth child and I just know very well to expect it and also have a lot of experience in responding to it. I am better at stopping it in its tracks than I was a couple of kids ago. Swimming lessons: She is still doing great with swimming lessons! She loves it. Gymnastics: I shared last time that at Brinley’s first gymnastics class, she was terrified of the balance beam. She has a literal fear of the beam. After her first class, her coach said she wasn’t sure Brinley would be able to continue in the class because of that fear, but was willing to work with her and see. Nate and I talked with Brinley extensively about it. I had no problem letting Brinley stop gymnastics if her fear was too much for it. I looked into tumbling class options so she could get some of the benefits. But Brinley was determined to work through her fear. And she has! She gets up on the beam by herself. She is super scared, but does it anyway. She told me she doesn’t want to be afraid of heights and she tells her body not to be. I am super impressed with this girl. I am blown away that she will face a fear like that and work through it as a five year old. Children really are amazing. Dance: Brinley has been loving dance! She is with the same studio and same teacher she has always had. Piano: Brinley loves piano. Her teacher commented that she was surprised by how much Brinley enjoys it. As Brinley has started these new activities this fall, I have come to realize Brinley is the type of person who is willing to work on a skill to get better at it. She is a perfectionist, but one who is willing to work. That is how Kaitlyn is, too, and it is such a beneficial quality in life. It is something that is just her, but it is a skill you can teach other kids. That isn’t the way Brayden is naturally, but through experiences in life, he has learned that practice does pay off and things do take practice. 8:30 PM–in bed by 8-8:30. Brinley Summary: 5 Years and 1 Month Old!